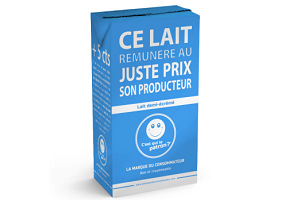 A new brand of milk – promoted as being created by consumers themselves – is set to be listed in Carrefour stores from this October, according to a report in LSA. Promoted by anti food waste campaign group Gueules Cassees, the milk is set to be offered at €0.99 per litre, a price reportedly determined by consumers through an online questionnaire and described as significantly above those typically paid to producers by the large dairy firms. The “good and responsible” milk will be offered in 1 litre cartons. The team behind the launch is also said to be looking at expanding into other categories within the packaged foods industry under the umbrella brand C’est Qui Le Patron / La Marque Du Consommateur (‘The Consumer Brand’).